I used to hate full service gas stations. I could hardly think of anything that felt more awkward and pretentious than sitting there on my royal behind like Meghan Markle waiting for the commoners to pump my gasoline. That was obviously before I had kids and had to do everything for everybody. Now I LOVE full-serve gas stations. There's one a few towns over and I don't visit often, but every time I do it feels like a trip to the freaking spa. 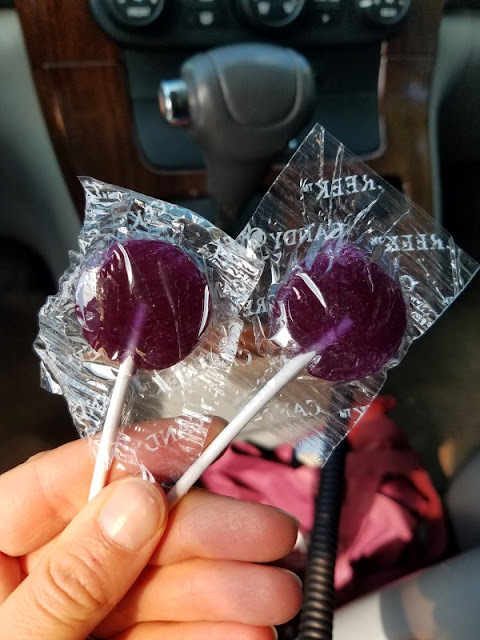 After the guy pumped my gas, he looked at my 2- and 4-year-olds in the backseat and asked if they'd like suckers. He grabbed two and as he handed them to me, I asked "So how many kids do you have?" "Two girls," he answered. "How did you know I had kids?" Automatically grabbing two of the same color so the kids won't fight? You learn that stuff on the first day of Parenting 101. I found a copy of The Friend, the kids' magazine published by our church, lying on the coffee table. It was open to a story about sharing and getting along called "A Real Hero." Instead of "Super Jake says no fighting," the main character is now shaking his money-maker on the couch yelling, "Hey everyone, look at my dance!" 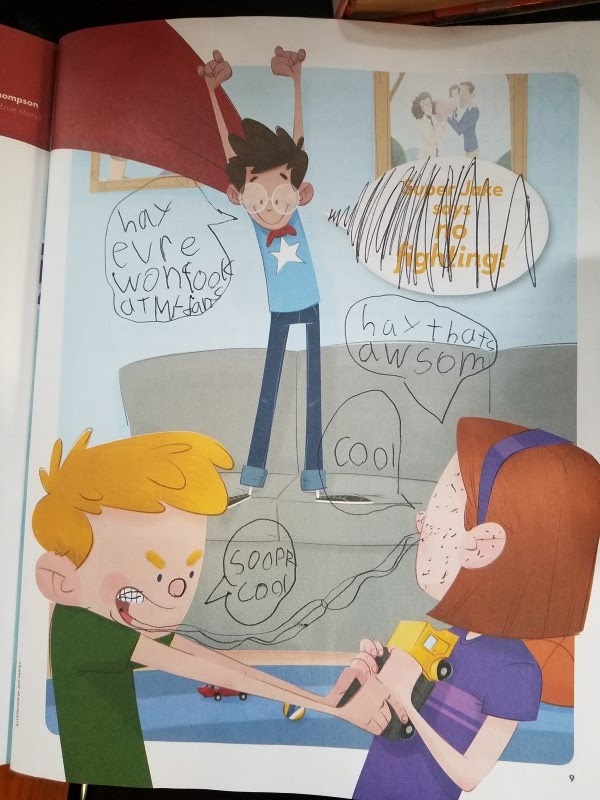 and the other kids are saying, "Hey, that's awesome!" and "Super-cool." So I'd say we're getting our money's worth out of our yearly subscription. I'm almost afraid to ask my daughter if it was her. I don't think I want to know. Every time we're at a soccer field or park lately, my toddler has been dragging me to the port-a-potty. He's newly potty trained so I'm willing to cut the kid some slack, but come on — half the time he doesn't even go! I don't understand the appeal of locking yourself in a tiny, stinky plastic prison cell when you could be playing at the playground, but I guess you have to be 2 to get it. Just yesterday, we went to a row of port-a-potties with the slogan "A Potty to Rent for Every Event!" stamped across the doors. My 12-year-old thought it was hilarious. "It must be hard to write port-a-potty slogans," she thought out loud. "I mean, what do you say about port-a-potties? 'Come sit in a box full of poop!'" I think we can rule out a career in marketing for one of our children, though I won't say which one. I'm not going to lie, I'm having a hard transition with this school year. Now that we've got a high schooler it seems like there are so many after-school activities, the older kids stay up as late as we do, and every day starts at 5 AM getting people up and out the door. I feel exhausted and on-call 24 hours a day, way more than when the kids were all little, and I'm really struggling trying to figure out how to fit in things like sleep and talking to my husband. The other day I said "Hi, how are you doing?" to someone and she randomly started talking about how she needs to be patient with herself during transitions, and I think that was probably God telling me I need to be patient with myself during this transition, too. It may take a little while to find our groove during this season of life, and that's okay. If not, I suppose it will at least get better in a few years when my oldest gets her license and can drive herself to her 5,042 extra-curriculars. Twice a week, Phillip plays basketball with a group of guys but when he limped through the door a half-hour earlier than usual on Saturday I knew something was wrong. He'd jumped and come down on someone else's foot, rolled his ankle and sprained it. After a few hours of pain killers and ice it was looking swollen and blue in strange places, so he agreed to go in and have it looked at to make sure nothing was broken. His foot is getting a little better every day, but you should see the gigantic bruise he's rocking right now. I was going to post a picture but then I realized that a closeup of a hairy, size 10.5 man's foot is actually pretty gross all on its own and this isn't really that kind of blog, so you'll just have to take my word for it. "I hate the food chain," my daughter told me the other day. She explained that she feels bad when she sees bugs stuck in a spiderweb and wants to free them, but then the spider would go hungry and she would feel bad for the spider. Funny, because I have a visceral "kill it!!!!" reaction whenever I see a spider but I usually don't because they get rid of annoying bugs which are the only things worse than spiders. So pretty much the same sentiment there. Clearly the children get their empathy for other living creatures from me. Thank you so much for your positive spin on life Jenny! Even the adjusting times. We have six kids, the youngest is 3 months and I feel like I'm loosing it! Seeing that you are handling six and you're happy is encouraging. Maybe someday I'll get there too. I look forward to your quick takes every week and today especially laughed out loud. Though I groaned a bit when you wrote that teen life is more exhausting than toddlers. I'm expecting our 3rd in a few weeks and already dreading the increase in sleeplessness. Oh well, it's all a season, right? (btw, that was me who posted on the last entry. I just forgot to add my name. For whatever reason (ineptitude) I only know how to comment using the "anonymous" option.